The average days on market for DSF and ASF homes was up 26 percent and 108 percent, respectively, from last year. Monthly supply of inventory for both DSF and ASF increased 17 percent from a year ago. The “odds of selling” – a number used to predict the likelihood of a buyer and seller reaching an agreement in a specific month – for DSF and ASF went down slightly compared to the previous month. 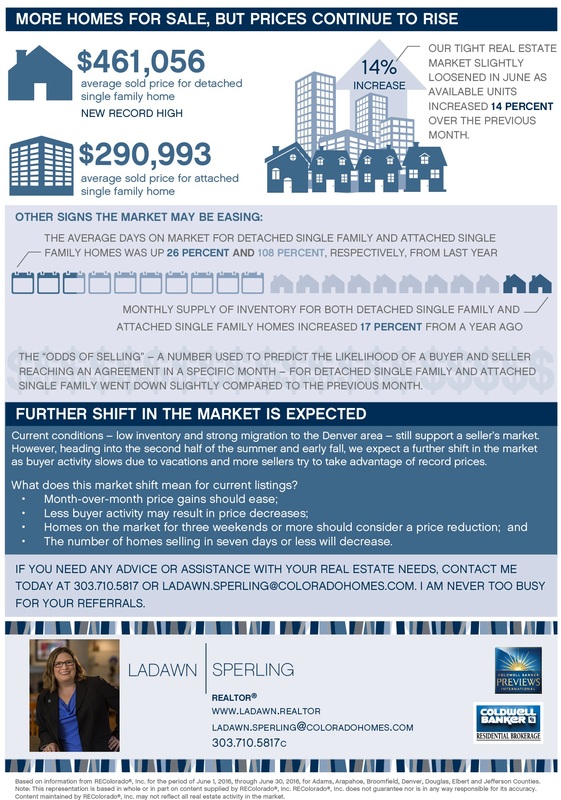 Current conditions – low inventory and strong migration to the Denver area – still support a seller’s market. However, heading into the second half of the summer and early fall, we expect a further shift in the market as buyer activity slows due to vacations and more sellers try to take advantage of record prices. What does this market shift mean for current listings? The number of homes selling in seven days or less will decrease. Based on information from REColorado®, Inc. and provided by Land Title for the period of June 1, 2016, through June 30, 2016, for Adams, Arapahoe, Broomfield, Denver, Douglas, Elbert and Jefferson Counties. Note: This representation is based in whole or in part on content supplied by REColorado®, Inc. REColorado®, Inc. does not guarantee nor is in any way responsible for its accuracy. Content maintained by REColorado®, Inc. may not reflect all real estate activity in the market.